Meyer Sound has added two new products to its arsenal: the MAPP XT, an audio system design tool that allows users to design systems with useful loudspeaker headroom information, and the Compass Go, an iPad app that makes system optimization more mobile. 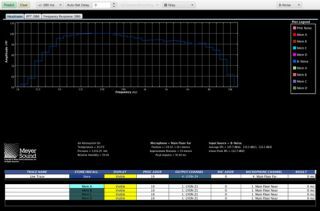 The MAPP XT shows the maximum levels to which Meyer Sound loudspeaker systems can be driven while maintaining linear performance, empowering customers to specify high-performance systems that reflect the needs of their shows. Headroom information is the most significant new feature in MAPP XT, and can be viewed from the perspectives of two different input signals. They include the traditional broadband pink noise and B-Noise, a new input signal designed to better represent the most common input spectrum in real-world applications. The Auto-Splay feature allows users to select the starting and finishing angles and automatically calculates the optimum splay angles between cabinets. Factor of Safety shows whether a proposed LEO or LYON array is within limits for the given configuration and angle to help users meet safety standards including 5:1, 7:1, and BGV-C1. The Gradient Subwoofer Array Tool quickly and accurately configures cardioid low-frequency arrays with the 500-HP, 900-LFC, and 1100-LFC models, saving valuable time for system designers. Trace Store and Recall provide fast comparisons of different configuration options. Relative Phase Response data allows users to combine different elements more easily. Export promotes easier sharing of system designs among project team members. MAPP XT is launched in conjunction with the new, patent-pending LEOPARD and 900-LFC linear line array system. Meyer's Compass Go is a new app that turns the iPad into a portable control device for optimizing Meyer Sound systems seamlessly and accurately. Compass Go provides a tablet extension to the Compass control software, the primary control interface for the Galileo and Galileo Callisto loudspeaker management systems. It enables users to adjust system delay, gain, and mute as well as the extensive U-Shaping, TruShaping and parametric EQ filter sets, while moving about freely anywhere in a venue. This new mobility can speed up setup and tuning before a show as operators listen for the coverage and quality of their main arrays and fill systems from different seats. To start Compass Go, users can simply connect their iPad to a Galileo or Galileo Callisto processor on the same Wi-Fi network. Compass Go displays the current parameter status and provides instant access to adjustments made at any control point of a device. Users can recall snapshots of prior user settings for modification and create, edit, and store new snapshot settings in the individual processors. To ensure mission-critical control continuity during a show, an active wired connection to the Compass desktop workstation is recommended.